Visualizing Archaeology Blogging, or, Is Anybody Listening? This image represents all of the contributions in response to Colleen’s first question for the Blogging Archaeology Carnival. 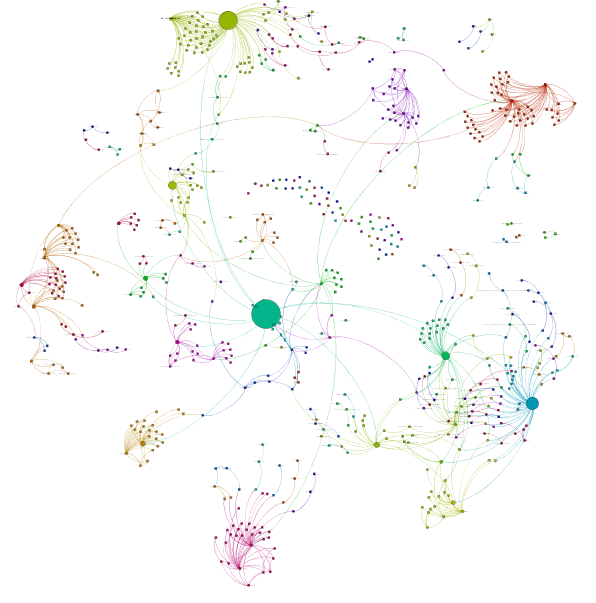 It was created in Gephi using the HTTP Graph plugin. With Gephi open and running, you set your browser to pass its information through Gephi, which then represents all of the resulting data in terms of its network relationships. So, I began by pointing my browser to Colleen’s post. Data began to fill the Gephi window. Then, I clicked on each link in turn, which would pour more data into Gephi. I returned to Colleen’s post, and then clicked on the next link. And so on. The resulting image (click here for an svg/pdf higher resolution image) shows how we’re all interconnected. One can automate this process by using Chrome with a web crawler (or see the video). Of course the model for understanding blogs that downplays the atomized post:comment relationship is not a product of the digital age and the internet. In fact, I think that the way most people read and write to the web has close parallels with traditions of modern academic writing and reading. Most academics do not pause to comment on specific articles or even individual conference paper (although books and reviews are an exception); instead they build references to these articles into their own work through the predecessor of hyperlinks: footnotes. The networks that have emerged among bloggers find have nice parallels with the intellectual networks manifest in academic citations. The biggest difference between the two practices is the speed with which the discourse can develop (and evaporate) through digital publication. I was over the moon when I got my first comment on my blog, oh-so-long-ago; I was especially chuffed when Bill had kind things to say about my blogging too (thanks Bill!). Nowadays what comments I get on average tend to be spam. Like Bill (and I suspect, everyone else) I sometimes get emails, phone calls, or ‘by the way’ notes that reference something I have blogged. I recently heard that a class at York in the UK uses some of my blogs in their course work (as examples of best practice or good ideas, I hope!) In which case, I think it is a useful exercise to try to map out the networks that we are creating through this prolonged short-form engagement with the profession, the public, and our subject matter. Blogging sometimes is a bit like “launch and forget”… but we need to have some idea who our community is and how far our thoughts are likely to percolate . We need to be aware of possible network effects in our blogging, and to use these to get our professional voice out there in those top five search results. Is anybody listening? Yes, probably; what I’ve tried to do in my little experiment today is to show how we can begin to approach the question of ‘who?’. Previous PostBlogging Archaeology at the SAA – What do you blog? If I’m reading your bubble thing correctly…it doesn’t seem to suggest that we are all that well integrated with each other, either (or, at least, my blog isn’t ;). That’s got to be the first place to start, right? To make sure that archaeology bloggers are supporting archaeology bloggers? Because one good way to start a comment stream going is by getting a couple comments…then people start building up courage and chiming in.